It's been a long time since I watched Woh Kaun Thi? 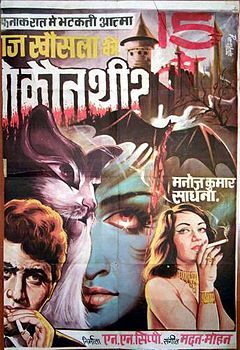 It's one of my favourite 'ghost' movies despite the presence of Manoj Kumar. (But there was Sadhana!) So one Saturday evening, my husband and I settled to watch the film, whose songs we know better than we remember the film itself. Woh Kaun Thi? begins, as all good 'ghost' stories do, on a dark, rainy night, with a car winding carefully down a winding, deserted road. Visibility is poor, and the car's wipers are working overtime, their slight swish-swish audible inside the car. Suddenly, the car screeches to a halt, barely missing a beautiful, young woman standing in the middle of the deserted road. All of the driver's questions elicit only enigmatic silences and cryptic answers from the stranger. His good samaritan instincts override his common sense, however, and he offers the young woman a lift. ... and the car's wipers come to life again. A puzzled Dr Anand continues his lonely drive and reaches his home where his mother is waiting for him. How was the dinner? she asks him, and a startled Anand, who had forgotten all about it, rushes straight out again. He quickly drives to Seema's (Helen) flat; as he rushes upstairs, he doesn't notice a strange apparition waiting in the shadows. But he cannot fail to notice Seema. A very upset Seema. If he's like this before they are married, what's it going to be like afterwards? Anand is very apologetic. He had been to visit a patient, and had completely forgotten that he was supposed to have dinner with her. He quickly changes the conversation to the 'ghost' he'd seen earlier. Seema is inclined to laugh it all off as a figment of his imagination, but as the story progresses, she is intrigued. Her dinner is destined to be interrupted, though. Anand's colleague, Dr Lata (Parveen Choudhari), wants him to return to the hospital immediately; an urgent case has been admitted. Anand leaves without eating. Meanwhile, a solicitor has come to meet Dr Singh (KN Singh) at the hospital; he wants Dr Singh to confirm that his junior, Dr Anand, is of sound mind. Both Dr Singh, and his daughter, Dr Lata, who is present there, are inclined to think he's joking. However, the solicitor is serious - Dr Anand is heir to a large fortune. His client has no children or immediate family. Since his family has a history of mental instability, his client wants to ensure that his fortune will be bequeathed to someone who is sane. If Dr Anand, who is a distant relative, does show any signs of mental illness, then the fortune will be bequeathed to someone else. Dr Singh is more than pleased to certify that Dr Anand is as sane as anyone else. Lata, in the meantime, has already informed Anand of his good fortune. While she teases Anand about his inheritance, and about Seema, it is clear that she is deeply in love with him. A fact that her father also realises the next day. After running into Ramesh (Prem Chopra), his cousin, at the party, and introducing Seema to him, Anand drops Seema off at her flat. Neither of them notice a stranger lurking in the shadows. A day later, Seema is attacked in the lift, killed by a cyanide injection. The cause of death leads the superintendent of police (Raj Mehra) to suspect the hand of a someone with medical knowledge, though he doesn't agree with his subordinate that Dr Anand is the murderer. As he tells the Inspector in charge of the case, the resolution of the case has to go back to simple basics: You find the motive, you find the murderer. First, he tells the Inspector, find out who benefits from Seema's death. And two, keep Dr Lata and Dr Singh under strict surveillance. Anand throws himself into his work in an effort to forget his grief. (His mother doesn't help by importuning him, at every opportunity, to marry a girl of her choice.) One stormy night, he receives a phone call summoning him to the bedside of a grievously ill woman. When he reaches the place, he is taken aback to find that it is the same haveli adjoining the cemetery where he had once dropped off that strange woman. The old man who escorts him there doesn't seem to notice how desolate and dilapidated his surroundings are. He guides Anand up the stairs to a dark, gloomy room where his patient lies - dead! But that is not the only shock that Anand gets that night. On his way back, he runs into some policemen. When he tries to report the young woman's death, they look quizzically at him; it appears that this young woman has died many times. Many doctors before him have filed the same death report. The locals say the haveli is haunted. Anand is furious - are they mocking him? He's just left that dead girl and her grief-stricken mother behind. The policemen are compassionate but disbelieving, and when Anand takes them back to the haveli, he discovers that it is as they said - there's no dead girl, no grieving crone. Unable to make any sense of what's happening, Anand returns home. And if all this wasn't unsettling enough, Anand comes across a torn newspaper clipping that asks for help identifying an unclaimed train accident victim. How can the same woman die so many times? In so many different ways? All this is affecting Anand's work (he ignores a call from the hospital), and he's admonished by Dr Singh. His superior is not an unkindly man, but he warns Anand that if he continues to let his emotions run amuck, affecting his work, it will be disastrous not only for him personally and professionally, but also for his patients. He too advises Anand to listen to his mother and get married. Dr Singh, of course, has vested interest in Anand's marriage. Finally, bowing to pressure, Anand agrees. Much to Dr Singh's chagrin, the bride is not his daughter, Lata. Anand is upset and angry and keeps his distance from his new bride. One day, a distraught Sandhya comes to the hospital to meet Anand. She hopes he will come with her to a place where they can be alone, and talk about the issues plaguing their marriage. Fascinated by her beauty and her conversation, Anand melts in her embrace and is more than half way to accepting Sandhya as his wife. His change of heart only lasts until they get back into the car, and the wipers stop working. Then, it is déjà vu time as the events of an earlier stormy night repeat themselves - Sandhya says the road is visible to her in the heavy rain; a suspicious Anand drives her to the old haveli, where one Sandhya had disappeared, and another (or the same?) Sandhya had died. This Sandhya, however, demurs - she's frightened, she tells Anand. The haveli has a malevolent aura; she fears that if she enters the house, she'll never return. And so it happens... this Sandhya disappears into thin air... When a distraught Anand returns home, it is to find Sandhya at home. What's more, his mother swears that she's been home all the time. Who is Sandhya? How can one woman appear and disappear at will? Is she a figment of Anand's derailed imagination? Or is she really a ghost? How is it possible for Sandhya to die in a train accident many hundreds of miles away, and still be visible that same night to Anand in his garden? When will this nightmare end? Or is Anand slowly going insane? Woh Kaun Thi? was supposedly (loosely) based on Wilkie Collins' late-19th century suspense novel, The Woman in White; Khosla's mentor, Guru Dutt, had intended to film the novel, and had indeed, begun a film called Raaz. (It was one of the many films that Dutt began, and shelved.) When Khosla took over the script, he also had Manoj Kumar rewrite parts of it, as Manoj himself corroborated in an interview. This was the first of Khosla's thriller-trilogy that continued with Mera Saaya (1966) and concluded with Anita (1967). From the very first scene, of a car winding through narrow roads in heavy rain, Khosla sets the mood, mysterious and spooky, ably complemented by Madan Mohan's music. Despite the plot holes, and there were many, and many red herrings that went nowhere, Khosla succeeded in keeping the mood of suspense going. Between Sadhana's enigmatic smiles and mysterious glances, and Manoj's slowly unravelling sanity, the viewer is pulled, willingly or unwillingly into the story of a man, his dead love, and his mysterious wife. Shot in her prime, Sadhana is achingly, hauntingly, beautiful. Woh Kaun Thi? cemented her status as a leading lady of stature, as she straddled the twin roles of an enigmatic seductress luring an unwary Anand to his death, and a bewildered young bride who has no clue why her newly-wed husband hates her so. Manoj Kumar, credited second, provides apt foil to Sadhana's histrionics. (It is her film.) As the man who loses his first love only to be trapped by a second, his slow disintegration was beautifully enacted. Not yet trapped by his signature mannerisms, a young (and yes, attractive) Manoj Kumar played the befuddled Anand well. The leads were ably supported by a stellar cast of characters - KN Singh, Parveen Choudhary, Dhumal, Raj Mehra... Prem Chopra, unfortunately, had little to do. Helen got to lip-sync to two duets, and looked startlingly lovely, and I wish they hadn't killed her off so soon. I've often wondered why Helen never attained real 'heroine' status - she was beautiful, she danced like a dream, and she was a competent actress. One cannot talk of Woh Kaun Thi? and not mention its score. This had some very beautiful songs, and it's a shame that Madan Mohan lost out to Laxmikant-Pyarelal for Dosti (which, to be fair, also had a beautiful score). As is to be expected from a Madan Mohan score, Lata Mangeshkar got the cream of the solos - Naina barse, the leitmotif of the film, Lag jaa gale, and Jo humne dastaan apni sunaye, along with one duet with Mahendra Kapoor - Chhodkar tere pyar ke daman. Asha came in with one solo - Shokh nazar ki bijliyaan, and one duet - Tikiriki tiki riki takori. Now for the flaws: One is often wondering which Sandhya it is whom we are watching. For instance, is it the other-worldly Sandhya who is singing Naina barse rhim jhim in the garden, while painting a landscape, or is it Anand's wife? If it is the latter, how does she know the melody? And if it is the former, how did she manage to land up in Anand's house, and where is the Sandhya who lives here? Is it this Sandhya who painted the haveli or is it her other-worldly twin? Who is who, here? The director leaves us without answers. Actually, that is some of the criticism that has been levelled against the film - many of the spooky instances seem to be put in just to add to the spookiness. There's no logic to why they were added, nor any explanation for why things happen the way they do. For instance, why do the wipers stop when the ghostly Sandhya gets into the car, and start again when she exits? We are never told. What's the connection between Sandhya's cut fingers and her professed love for blood? (This happens twice in the film.) Who is this stranger who was always lurking around Seema's flat? Why is she there? Her presence is never explained either. And then there are all those obvious red herrings that throw suspicion on random people that seemingly lead nowhere. The ending is a tad bit too pat, and appears contrived. Flawed it may be, but logic (or illogic) aside, Woh Kaun Thi? is still very entertaining. The mood was set from the very first scene, and Khosla managed to keep it so - despite the flaws. Is it the finest ghost film from that period? I don't know. I do know that in spite of repeated viewings, I have not tired of it. Posted by Anuradha Warrier at 1.10.15 Labels: 1964, 60s Cinema, Dhumal, Helen, KN Singh, Madan Mohan, Manoj Kumar, Mohan Chhoti, Movies: Hindi, Parveen Choudhary, Prem Chopra, Raj Khosla, Review, Sadhana, Woh Kaun Thi?